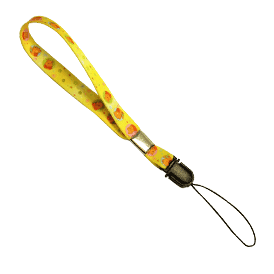 A custom wrist lanyard offers a great way to convey your message while holding your cell phone, PDA, iPod, camera or other small device. Wrist lanyards help you hold onto your important electronic devices. Simply slip the nylon loop through the lanyard slot on your device and you are ready to go! Full color sublimated printing on both sides. Standard size is 3/8" wide and 4 1/2" to 6" in length. Custom charms are available, please call for details and pricing. Add a custom Smudge Away to clean the screen on the device. See our Smudge Aways section or call for details and pricing. 3 weeks after approval of artwork or pre production sample.